I had no clue about betanin, the dye that gives beetroot the deep red color, when I saw my friend's lunchbox with red rice during my kinder garden days. I went back home and asked my mom to make me red rice. You should have seen the surprise on her face! From that time on I like this brilliant red color and the vegetable. The other major ingredient in todays dish is carrot which is rich in beta carotene. Beta carotene gets converted to vitamin A and is good for your eyes. I used to tell my daughter when she was smaller, that if she eats carrots her eyes will sparkle like that of a bunny. 1.Heat oil in a pan. 2.Throw in the vegetable slices along with chillies and salt. 3.Cover and cook till the vegetables get tender. 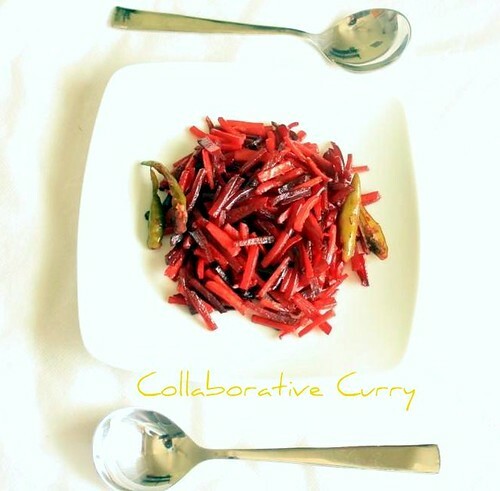 5.Serve with rice and Sambar . Fantastic..da! Love the photos..especially the last one. I love beetroot and V does not but I buy and cook them just for myself. Oh! How wonderful! I've never tried cooking beetroot before, you've now inspired me to give it a try. Thank you for such a great quick and easy recipe with smart choice of veggies. What a wonderful side dish, thank you!! Lovely pics....looks colorful and yumm. Nutritious dish...lovely picture to compliment the recipe. My fav but i usually grate them..nice click as usual..
a treat to the eye recipe :) and good for health. Lovely colour. beets and carrot makes a wonderful combo. lovely pics dear..........healthy and delicious recipe. super, colourful and delicious photos. 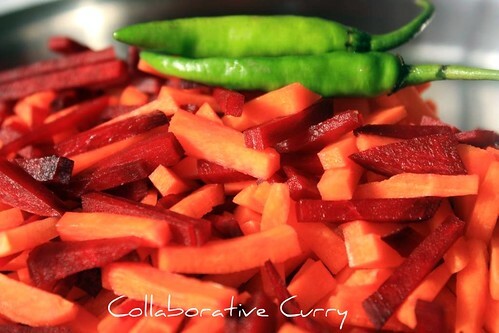 The bright colours of the carrot and beetroot r a treat for the eyes.A very healthy curry also. How could you turn something so simple into such a delicacy! Beautiful pictures as always! Very colorful indeed, lovely clicks. Such a colourful stir fry...fantastic! Wonderful color combo. Loved the pic. Sure healthy and tasty recipe. Nice n colorful! Love the first picture! This dish look so beautiful. Wow! what awelcome colour!!! Simply loved the stirfry. Simple and colorful .Beautiful pictures! Absolutely lovely colors there!And I love how you cut the veggies..
so simple ingredients for that elegant stir-fry!! lovely!!! Thanks for your encouragement !! 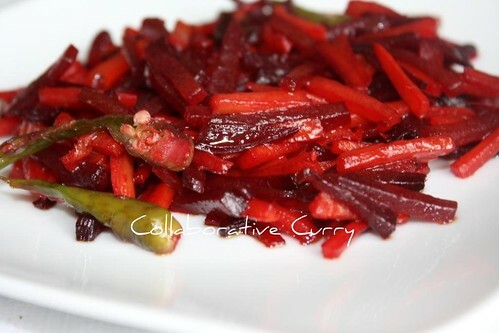 I too make the same thing with carrot and beetroot,but I grate it ...Dont have the patience to slice it..I m sure that sliced one will be much much tastier than grated one. Lovely dish. I love beetrot, but I have never made it with carrot. Will try this out. A wonderful tasty dish!! I so love beetroots! We will be back in a week ! !